Dedicated to creating a story and environment that is a true representation of graffiti culture, fashion pioneer Marc Ecko has enlisted 50 of the world's most elite graffiti artists to lend their best artwork and personal experiences to the game and consult with The Collective to give Getting Up: Contents Under Pressure the authentic look and feel of a real urban environment. The game creates its own genre of gameplay, combining combat, action, adventure and stealth. 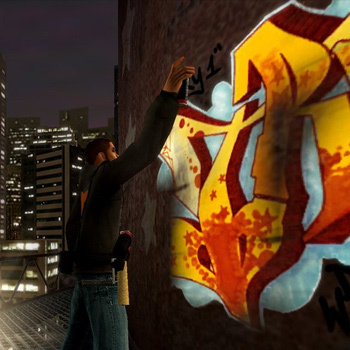 It uses a thrilling graffiti-driven framework to tell its story of self-expression and the fight for creative freedom. A thug, an outcast, a rebel...the lead character, Trane, is all of these in Getting Up: Contents Under Pressure. He sets out to earn his street cred by getting his graffiti tag up throughout the politically oppressive city of New Radius but as events unfold, Trane becomes the unlikely leader of an urban revolution. The story's "Get In, Get Up and Get Out" gameplay mechanic offers gamers a unique arsenal of swift stealth and street fighting abilities to GET IN restricted areas of New Radius and battle through the city's rough streets; the dexterity and agility to scale any object in order to GET UP and place graffiti tags, spreading the message of rebellion; and the ingenuity to evade, escape and GET OUT.